The introduction of the nail gun transformed the housing construction industry. Reducing the time it takes to shingle a roof or build a frame to a fraction of what it was with a manual hammer, the nail gun quickly became one of the most useful tools on the site. Along with the benefits, however, came serious injuries and even fatalities. In fact, according to the Centers for Disease Control, nail gun accidents result in 37,000 emergency room visits every year. Unintended nail discharge from double fire. Some nail guns can easily double fire and injure a worker who is not prepared for the second nail. Unintended nail discharge from knocking the safety contact with the trigger squeezed. If the trigger is squeezed in preparation for making contact with the intended surface and is then knocked accidentally, the gun will fire into whatever is nearby. Nail penetration through lumber. Even a properly-placed nail can penetrate through a piece of lumber into a worker’s hand or leg. Nail ricochet from striking a hard surface or metal feature. When firing into a hard surface or unknowingly into metal, the nail can ricochet and hit the nail gun operator or bystanders. Missing work piece. A poorly aimed nail can miss the intended surface completely and hit the operator or nearby worker. Awkward position nailing. Nailing above shoulder height or while on a ladder can place the user’s body or another worker in the line of fire, increasing the chances he or she will be hit by a misplaced nail. Bypassing safety mechanisms. 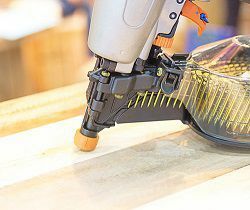 Disengaging the safety contact tip is the riskiest use of a nail gun. As contact with a surface is not required to fire the gun, it can easily discharge and hit a worker. It is vital that nail guns always be used only as designed and that all operators are properly trained in how to use them. If you are injured by a nail gun on a construction site, you may need to file for worker’s compensation. Call the law offices of Steve Lee to see how we can help you get the maximum benefits you are entitled to. Call now at 800-232-3711.
Who Is Most at Risk for Construction Site Injuries?